Elle: First race of the year, folks! Ragnar Del Sol - a 24 hour, 200 mile relay race from Wickenburg, AZ to Tempe, AZ. Even though it's not all that competitive (we're not winning anything here), it's still a race with thousands of other people, and a chance to get out on the road and see what you've got at the beginning of the season. And the race is in the Arizona desert, one of my favorite places. Webb: Before we left for the airport we hopped on the trainers to do thesufferfest.com's "A Very Dark Place." We tried to keep the intensity as prescribed but we focused on keeping our cadence higher. We don't want to go into this adventure with heavy, non-responsive legs. With that in mind, we also donned our compression wear. Recovery with a reduced chance of fatal blood-clotting. Bonus! Elle: When I first got my Zoot compression tights (a b'day present from Webb, thanks! ), it would take me so long to get them on, I rarely wore them. But like anything, practice makes perfect. Or at least acceptable. So I've gotten better at it. It was nice to have them on during the plane ride, since it tends to be cold up in the air, but it was equally nice to get them off when we landed. Webb: We needed to do all we could to have fresh legs because we scheduled a V02max/fitness test for the day after our arrival. Unfortunately the only time slot available was 6:30AM. Ugh. Whatever, it was going to be worth it to have a professional administer a fitness test. Elle was smart; she went to bed early. I, on the other hand, stayed up a bit late visiting with mi familia. The test was fantastic. First, we met with Darrin Permenter of Synaptic Training and Testing who administered the test and educated us on the why's and how's. Then I climbed on the Woodway Treadmill and put on the mask that would capture the amount of oxygen I took in and how much C02 I exhaled. By doing this, you can determine your ventilatory threshold (VT or alternatively, LT - lactate threshold), the point when you cease burning fats for fuel and rely on carbohydrates alone. Carbs burn hot and fast leaving you with nothing. It is best not to cross that threshold too soon. The actual test involved a warm-up followed by graduated increase in speed. Once I reached 10 mph (my predicted top pace), Darrin started to increase the grade until I conceded defeat. You don't need to give a maximum effort for the test be effective as the main purpose is to mark your VT/LT. I wanted to know what I could handle, so I took it as far as I could. My legs felt surprisingly good even at the end. I had to stop when I became light-headed and my mind disconnected from my body. It was an extraordinarily humbling and motivating experience. Our results showed that we have a ways to go, which also means we have potential. Darrin also gave us a plan to set us on the path to meet that potential. Good times await. Elle: I really wanted to give it my all for the test. And I guess I did? When I was done I couldn't help but think I could have gone for another minute. But either way, I got some good information about my VO2 max and heart rate that I can use to maximize my training for the upcoming season. Webb: It turns out Darrin is not just great at explaining the VT/LT business. He is also great at recommending breakfast joints. 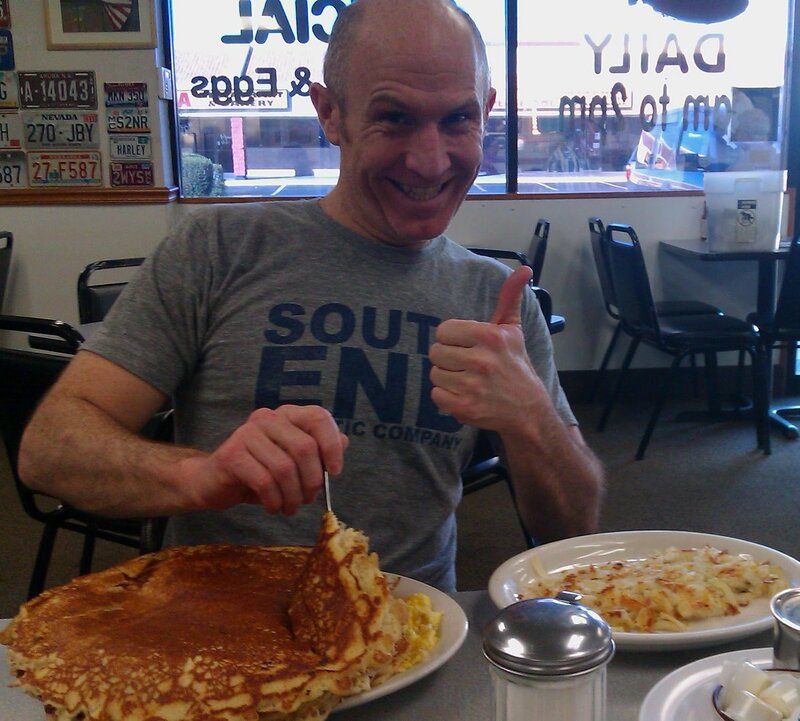 I love pancakes, french toast and waffles, especially the morning of the day before a race. Darrin sent us to Crazy Otto's. He said the pancakes would be big. He was not wrong.